The great natural harbour of Maputo (Delagoa Bay) was discovered by Vasco da Gama in 1498 and lies on the sheltered estuary of Rio Espirito Santo in southern Moçambique at Longitude 32° 34' E and Latitude 25° 58' S.
The port has significant regional potential and is handling growing volumes of trade from South Africa, Botswana, Swaziland and Zimbabwe. It is southern Africa's nearest port to the rapidly developing mega-markets of Asia and is the closest deep water port to Johannesburg, Mpumalanga and Limpopo. As part of Moçambique's highly successful programme of economic recovery, a 25-year concession to manage and develop the port was awarded to a European port management consortium in September 2000, which subsequently formed a Moçambican joint venture, the Maputo Port Development Company (MPDC) to take over the port in April 2003. Later in 2003, MPDC launched its development plan by implementing a US$70 million (approximately R455 million) priority works programme designed to quickly restore the basic essentials of an international trading port. Amongst many other key improvements, the approach channels have been restored to design depth (-11m), continuous 24/7 port operations have been established, security has been rigorously tightened, internal roads and railways have been rebuilt and new handling equipment and training schemes have been introduced. Port Maputo has direct road and rail connections with Johannesburg (550km), Mpumalanga, Limpopo, Swaziland and Zimbabwe. Work on upgrading the main line to South Africa, creating capacity for 13 million tonne per annum by 2010 has been completed. In addition, the main line to central Zimbabwe has been rebuilt with generous American assistance and now offers 5 day transit times between Bulawayo and Maputo. A new port access road carries heavy road traffic clear of downtown Maputo and connects the harbour direct with the M4 Highway running 600km westwards through the industrial and mining heartlands of South Africa. Mariners have a choice of two channels for reaching the Pilot Station at Buoy 6; the North Channel and the South Channel. 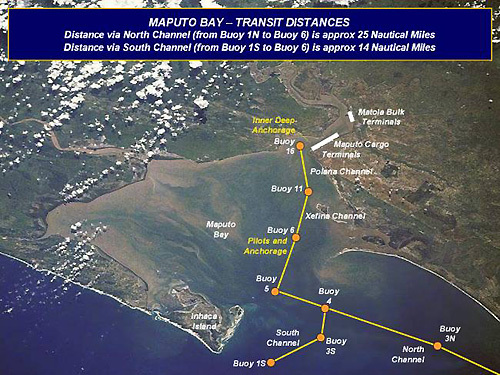 Using the South Channel saves about 11 miles for vessels arriving from South African ports, but this channel is subject to strong tidal sets and Masters are advised to check with the port authority before using it. Channels and shoals are marked with buoys and beacons. Pilotage through the Xefina and Polana channels into the berths is compulsory from Buoy 6. Port Maputo has two modern Z-Peller tugs each of 27 tonne bollard pull. 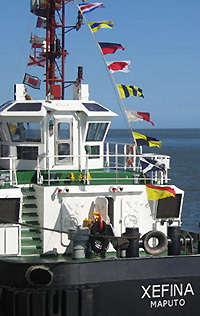 Depending on weather conditions, pilots embark by fast semi-rigid cutter or harbour tug. In January 2002, Business Day reported that throughput had dropped to 1.2 million tonnes however, as a result of new investment and the re-awakening of interest in Port Maputo, 6.2m tonne was achieved in 2005, a rate of growth that underlines market confidence in the port's future. Ultimate capacity is well in excess of 20 million tonnes. 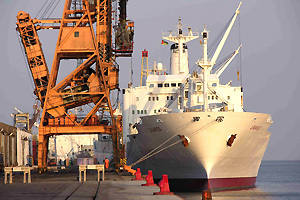 Port volumes for 2012 are estimated at 14 million tonnes, well indicating the success of Maputo as a port. New investment is quickly re-establishing the port to handle a full range of regional trade through modern, secure and privately owned terminals. 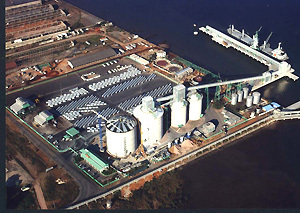 There are two main components to the port, the Maputo Cargo Terminals, which include the Citrus, Sugar, Container, Ferro and Scrap terminals and, 6 km further upriver, the Matola Bulk Terminals with four deepwater berths for handling bulk Minerals, Petroleum, Aluminium and Grain. In total, the port has 16 linear berths totalling approximately 4,000m. All are served by road and most by rail. There is a small privately managed dry dock capable of accepting vessels up to 115m LOA and 17m beam. 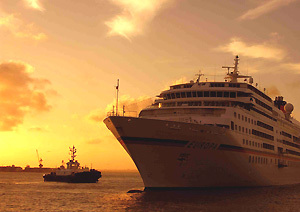 Ship repair services, diesel bunkers and fresh water are available at all berths. Stevedoring and ship chandlery are readily available. Two attractive privately managed marinas provide excellent secure facilities for cruising yachts.